Strawberry jam-topped plain or sultana scones and a dollop of clotted cream. Lovely. For larger 5cm/2in scones, bake for 10-12 minutes. Step 1 Preheat the oven to 220C/200C Fan/Gas 7. Lightly grease two baking trays. Step 2 Put the flour, baking powder and sugar in a large bowl. Add the butter and rub in with your fingertips until the mixture resembles fine breadcrumbs. Step 3 Crack the eggs into a measuring jug, then add enough milk to make the total liquid 300ml/10fl oz. Stir the egg and milk into the flour – you may not need it all – and mix to a soft, sticky dough. Step 4 Turn out onto a lightly floured work surface, knead lightly and work in the sultanas, if using. Roll out to a rectangle about 2cm/¾in thick. Step 5 Cut into as many rounds as possible with a fluted 5cm/2in cutter and place them on the prepared baking trays. 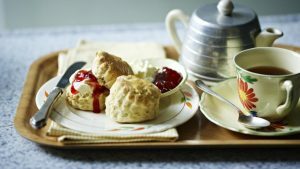 Brush the tops of the scones with a little extra milk, or any egg and milk left in the jug. Step 6 Bake for 12–15 minutes, or until the scones are well risen and a pale, golden-brown colour. Lift onto a wire rack to cool. Eat as fresh as possible. Step 7 To serve, split the scones and serve with strawberry jam on the plain scones along with a good dollop of clotted cream.